A major roadblock to harnessing the power of Distributed Energy Resources (DERs) and Demand Response (DR) assets has been the lack of efficient, affordable, and secure communication paths. These devices — such as digital thermostats and water heaters — are typically sold through third-party retail outlets directly to the end users, meaning they operate on a wide diversity of operating systems and communications platforms. How can utilities efficiently connect to all of the devices they want to measure and control, without opening themselves up to harmful cybersecurity vulnerabilities? OATI GridPort™ and OATI MyGrid Switch™ provide a secure, cost-effective way for utilities to collect data and exercise control commands over connected DER assets. OATI GridPort is an innovative, easily-deployable solution for utilities to securely connect end-use devices to the distribution grid. GridPort is an intelligent gateway device designed to facilitate sensing and control of residential grid assets, including thermostats, water heaters, pool pumps, window air conditioners, central air conditioners, electric heating units, solar PV, and more. Multiple grid assets can communicate directly with a single GridPort via supported protocols. GridPort can also be used in substation, generator, pole-top/end-of-line, commercial, and industrial applications. This best-in-breed device can talk to a wide variety of subordinate controls and sensors using utility standards including DNP 3.0, Modbus, SEP2.0, ZigBee, and local analog sensing. OATI GridPort™ Edge is an advanced and affordable solution for utilities to securely connect and integrate end-use devices to the electrical grid. This smart device facilitates the communication and control of residential grid assets and helps utilities attain enhanced visibility into behind-the-meter data. The newest model of the OATI GridPort™ product line, is the CTA-2045 Universal Communication Module (UCM), offers utilities a secure, industry standard solution that connects and integrates end-use devices to the electrical grid. The device plugs directly into CTA-2045-supported appliances like water heaters and electric vehicle chargers, and enables the control, monitoring, and communication of the appliance with OATI systems. 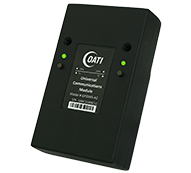 The OATI MyGrid Switch is a powerful, yet simple and cost-effective, solution for utilities to turn indoor plug-load appliances, such as window air conditioners and other larger indoor loads, into DERs. It pairs with the OATI GridPort to form a wireless Home Area Network (HAN), allowing utilities to monitor and manage energy consumption, while providing homeowners convenient control and energy management over their appliances. Further, the advanced metering and sensing capabilities of MyGrid Switch provide utilities with a granular and detailed behind-the-meter view of voltage, watts, and other key measurements to enable enhanced grid operations, such as Conservation Voltage Reduction (CVR) and plug-load submetering. GridPort and MyGrid Switch are part of the OATI GridControl™/℠ system, which provides data acquisition and asset control of DERs and other Smart Grid devices to support DR programs and other applications. OATI GridSafe™/℠ provides robust data encryption and cybersecurity protections for communications over the public Internet and other networks from GridPort-connected devices to the GridControl headend.